Coenzyme Q10 is an own active agent of the body and is also called ubiquinon. Coenzyme Q10 has got first class antioxidant properties and is indispensable for every cellular function. 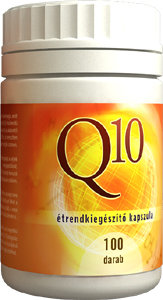 Coenzyme Q10 supports energy replacement of cells as a catalyzer. Participates in building up energy centres of cells and plays a key role in intracellular processes. Q10 functions just like energy producing power plants. Energy taken through nutrition will be transformed into a form that can be utilized during biochemical processes to be adaptable to consume by and inside the body. Q10 levels of the body reduce during the ageing process. Q10 is not a strange element of the body, as it is produced by our system, but not always in satisfactory quantities! Following an average diet it is nearly impossible to produce the required quantity of coenzyme Q10 (its natural sources are mackerels, salmon, sardines, beef heart and liver), therefore its supplementary intake is necessary. Application of Q10 is primarily beneficial in case of cardiovascular diseases, just as chronic heart conditions with water retention symptoms, coronary heart disease or hypertension. Efficiency rate of detoxitacion processes is enhanced , ageing processes slow down, cellular life is prolonged by its use. It can be applied in case of certain vision problems, it is very efficient in preventing formation of cataracts. It is a strong antioxidant and also helps to provide an efficient functioning for the immune system, as these are highly energy-intensive. There are ten types of common coenzymes, but only Q10 can be normally found in human tissues.